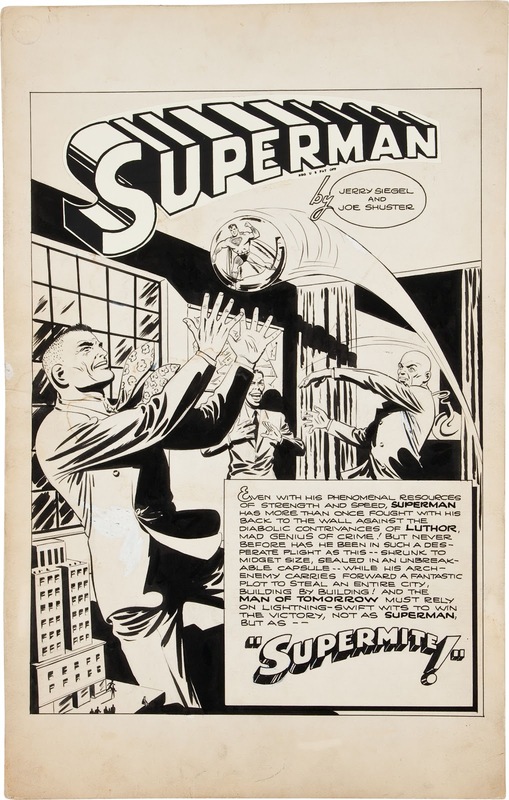 Looking at the original art for sale over at Heritage Comics I found the following: a complete (and previously unpublished) 12-page Superman story from 1944, "Supermite! ", presumably written by Jerry Siegel and drawn by Joe Shuster's studio. The pages can be found here. Maybe not as exciting a find as the famous "K-Metal" story from 1940, but still an entertaining story featuring mad scientist Luthor and the classic Superman-Clark Kent-Lois Lane triangle. I don't know much about prices for original comic art, but some of the current bids seem to still be quite low. The next few weeks should let us know if these pages end up selling for a price as high as the price of Jerry Siegel's potential clone. 2011/10/28 update: A couple of details I didn't mention yesterday: Heritage's description mentions that the story came from the collection of Jack Schiff, and also that the late Richard Morrissey had identified the writer as Jerry Siegel (which would suggest that the story has been circulating in fandom for some time).